Kyoto is a city rich in Japanese culture. Around every corner there is something new to discover. 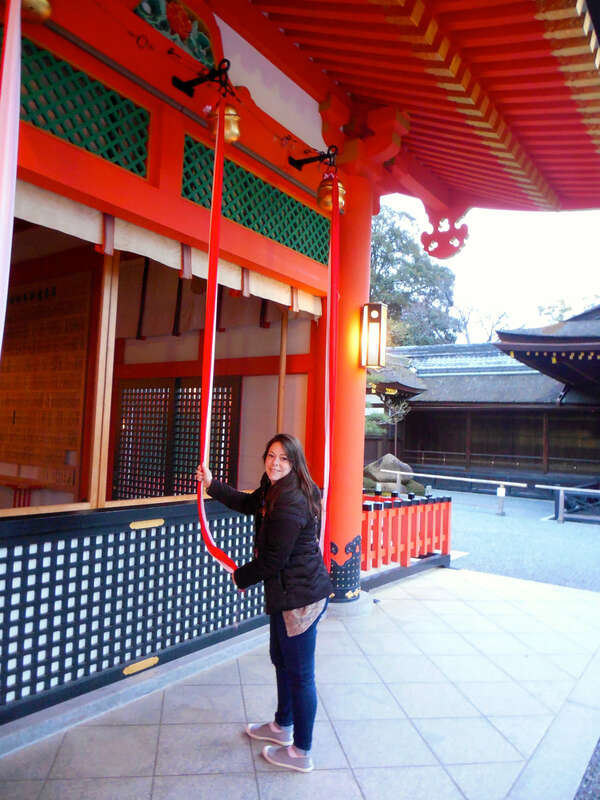 People wear the traditional Japanese kimonos and there are temples with zen gardens everywhere! 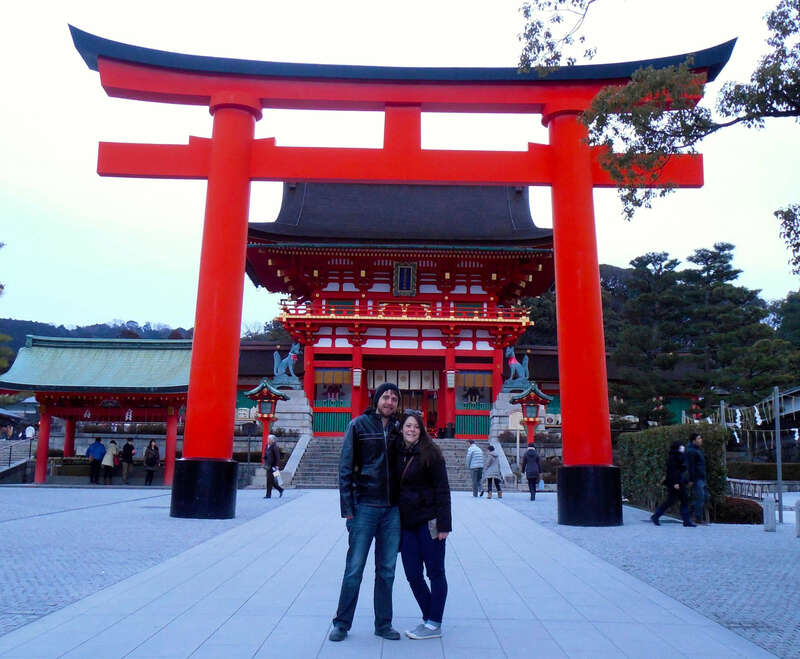 When Jess and I visited Kyoto we saw more amazing site in just a few days than I ever could have imagined. But there was one very special place that we were sure to fit into the schedule. Fushimi Inari-tasisha, or as we westerners with thick tongues and horrible Japanese often call it, The Red Gates Temple. Fushimi Inari-Taisha is located in Fushimi-Ku, Kyoto at the base of a mountain. 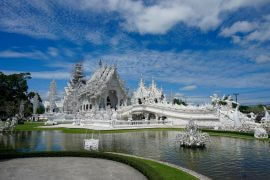 Construction of the shrine originally started in 711 AD and at that time it was located in Inariyana. 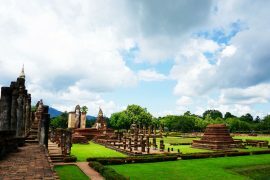 In 816 AD it was moved to its current location and the vast majority of the temple as it exists today was built in 1499 AD. The temple was designated Kanpei-taisha or governmentally protected, in 1871 AD. The temple is actually a Shinto shrine dedicated to the Kami (or spirit) Inari. Along with fertility, rice, tea, sake, agriculture, and sword making Inari is most prominently recognized as the spirit of foxes. Which is probably one of the main things you will notice upon visiting the temple, there are statues of foxes everywhere. The statues are almost always in pairs, one to the left and one to the right, representing male and female. Whenever Inari is depicted as human it is equally common to be shown as a man or a woman. Look at all those arches! 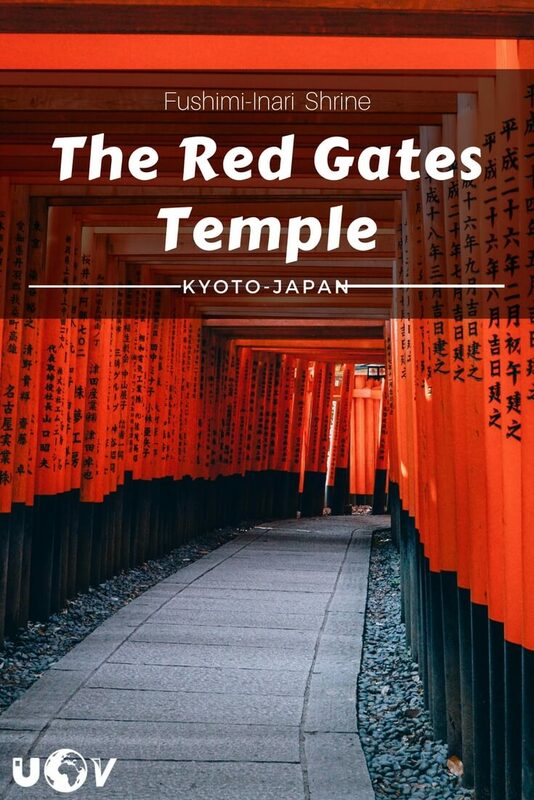 One of the most noteworthy things you will also notice at Fushimi Inari-Taisha are the orange gateway arches. These are called Torii and there are thousands of them at the temple. Torri dedicated to Inari can be found all over Japan, but you will find more at Fushimi Inari-Taisha than anywhere else. Japanese businesses have donated many of the Torii. 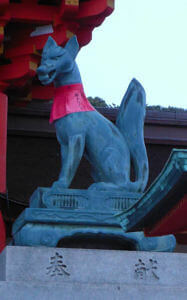 This is because Inari is known as the spirit of agriculture, good business, and prosperity. It is also common for Japanese businesses to have Torii dedicated to Inari on the roof of their corporate headquarters. We made an effort to watch as many Japan oriented movies as possible before heading to Kyoto including, Memoirs of a Geisha. 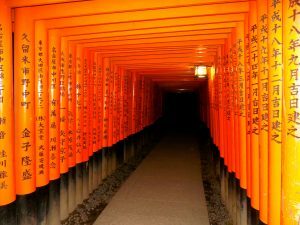 If you have seen the movie then you have seen the Torii of Fushimi Inari-Taisha in the scene where Chiyo runs through them. I would imagine this shot was relatively easy to get when you consider the fact that there are approximately four kilometers (2.5 miles) of Torii at the shrine. To get to Fushimi Inari-Taisha I would recommend leaving early! 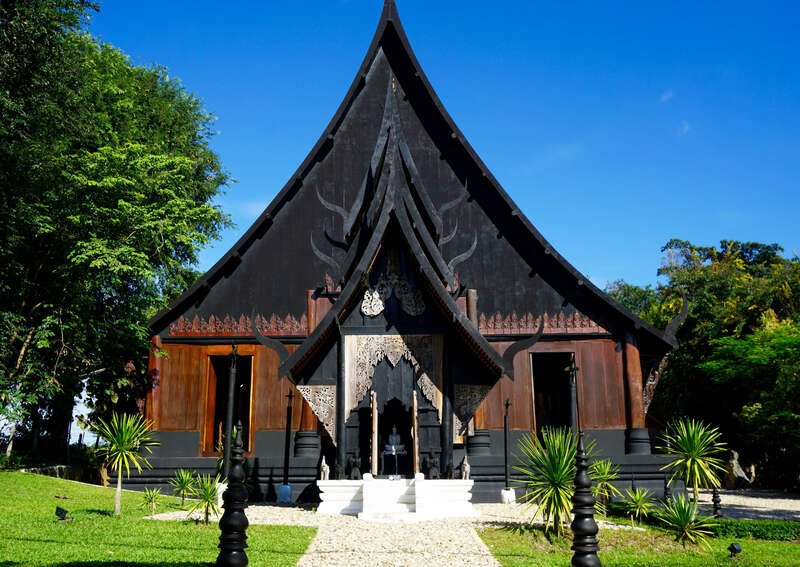 Dedicate an entire day to this one shrine if you have the time in your trip. Most people just take the subway since the temple is only a five-minute ride from Kyoto station. You are going to want to get off at JR Nara Line Inari Station. From there it is a relatively short walk through a ton of street vendors. Once you have arrived, go slow. 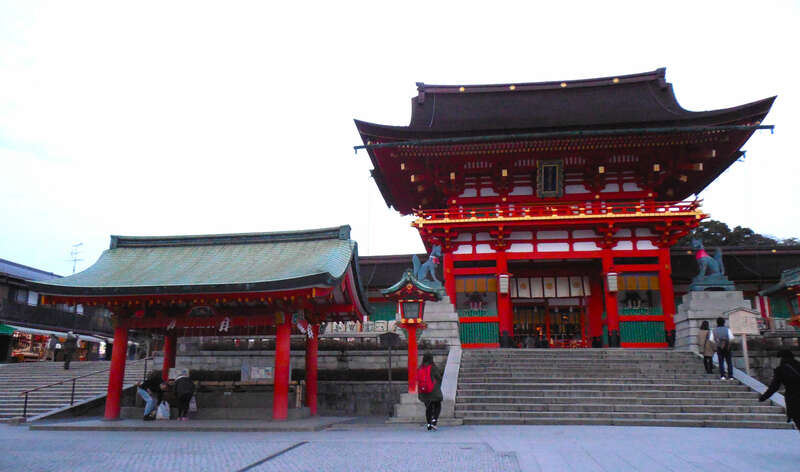 Take your time to thoroughly enjoy the majesty of Fushimi Inari-Taisha. Spread throughout the four kilometers of Torii are a number of smaller shrines. This, in my opinion, is one of the greatest things about the temple. Yes, it’s going to be packed just about any time you go, it’s a pretty famous temple. However, the complex is so large you can always find a little secluded spot to walk hand in hand with that special someone, or even capture the perfect photo without other people in the background, and we all know that pictures like that are truly a rarity. Japan is an amazing country and if you have the time you should definitely explore it! 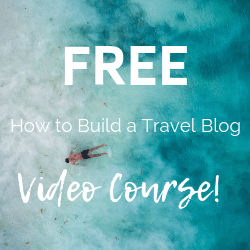 If you are looking to get off the tourist track, check out these unique Japan experiences you definitely should not miss! Have you been to the Fushimi Inari-Tashshia shrine in Kyoto? Dreaming about visiting ever since you saw it in Memories of a Geisha? Tell us about it in the comments below!